By Srinivas Chowdary Sunkara // petrobazaar // 3rd Dec, 2018. 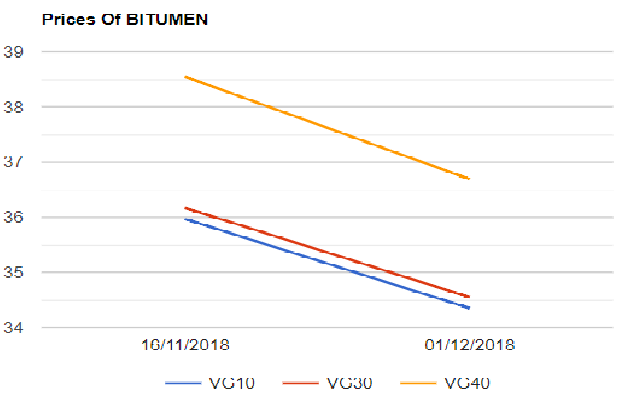 As expected, Bituminous product prices have come down by above 4 percentage for the first fortnight of Dec. All the National oil marketing companies in India revised down the Bitumen product prices by Rs.1620/- per Mt as on 1st Dec, 2018 from earlier price. As per the latest publication of oil marketing companies, In Visakha, The basic prices of Bitumen 10 (Bulk), Bitumen 30 (Bulk) and Bitumen 40(Bulk) product prices are went down by Rs.1620 per Mt each to Rs.34350/-, Rs.34550 and Rs.36690/- per Mt respectively. All the product prices are going in tandem with global crude markets and international bunkering markets. We can reflect on the fact that the crude lost a 3rd of its value since the beginning of the month.